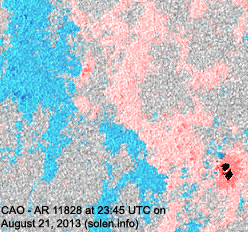 Last major update issued on August 23, 2013 at 04:45 UTC. 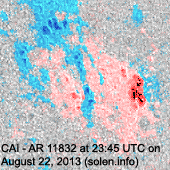 The geomagnetic field was quiet to unsettled on August 22. 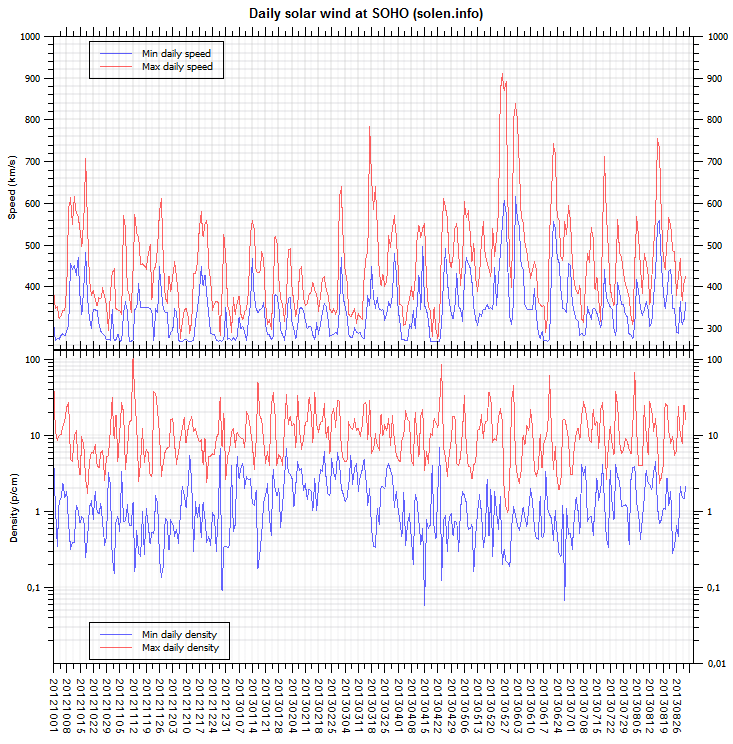 Solar wind speed at SOHO ranged between 438 and 563 km/s, most of the day under the influence of a high speed stream from CH580. 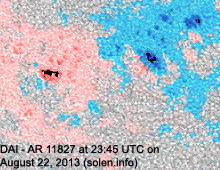 A solar wind shock was observed at 18:41 UTC at SOHO (possibly associated with the arrival of the CME observed on August 20). 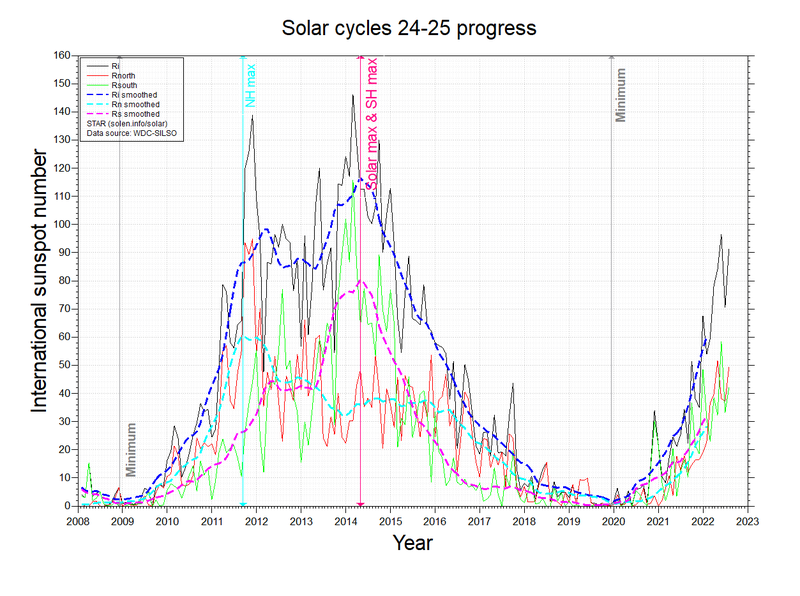 The total field of the interplanetary magnetic increased and the IMF swung more southwards resultingin an increase in geomagnetic disturbance levels. 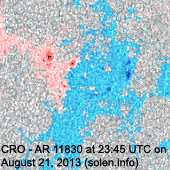 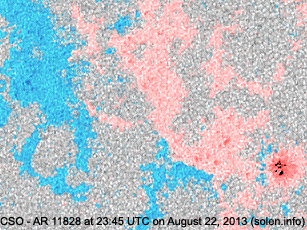 Solar flux measured at 20h UTC on 2.8 GHz was 131.6 (increasing 22.1 over the last solar rotation). 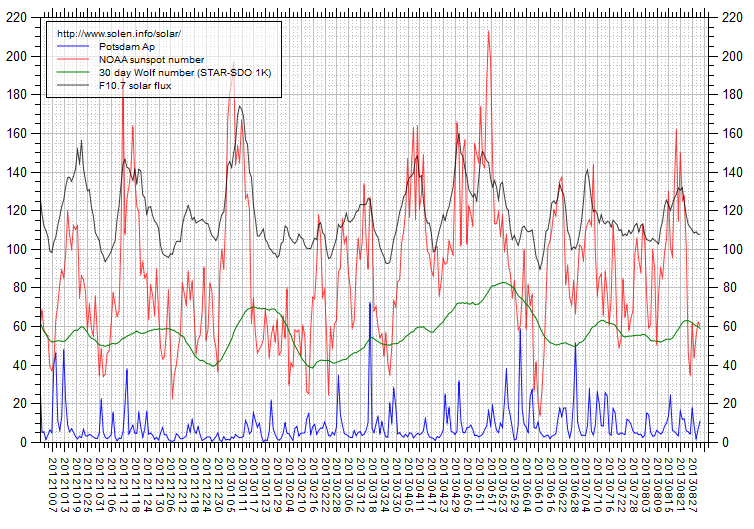 The Potsdam WDC planetary A index was 12 (STAR Ap - based on the mean of three hour interval ap indices: 11.8). 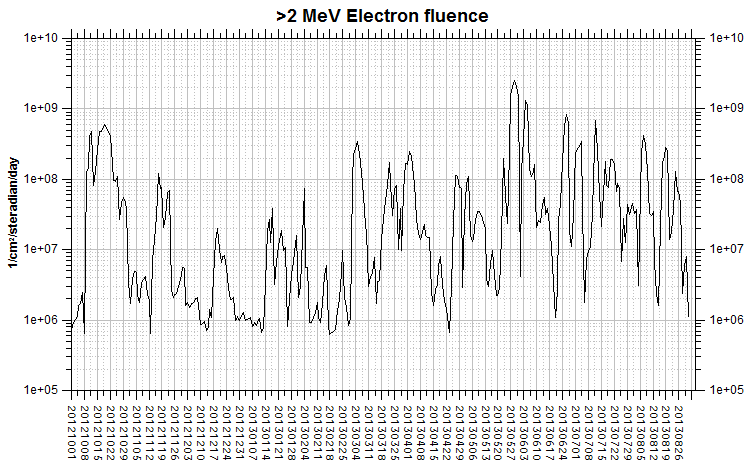 Three hour interval K indices: 33212233 (planetary), 34322333 (Boulder). 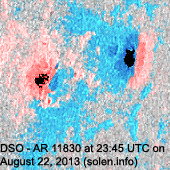 Region 11820 [S13W59] decayed slowly producing a few C flares. 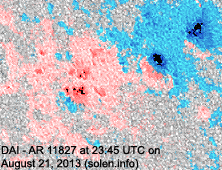 Region 11823 [S07W21] gained a few spots and was quiet. 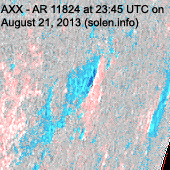 Region 11825 [N13W70] decayed slowly and quietly. 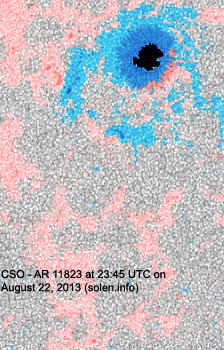 Region 11827 [S18E19] decayed slowly and quietly. 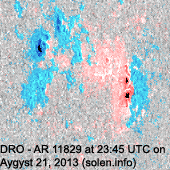 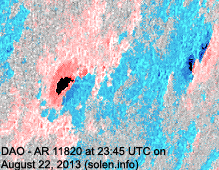 Region 11828 [N14E28] displayed no major changes and produced a few low level C flares. 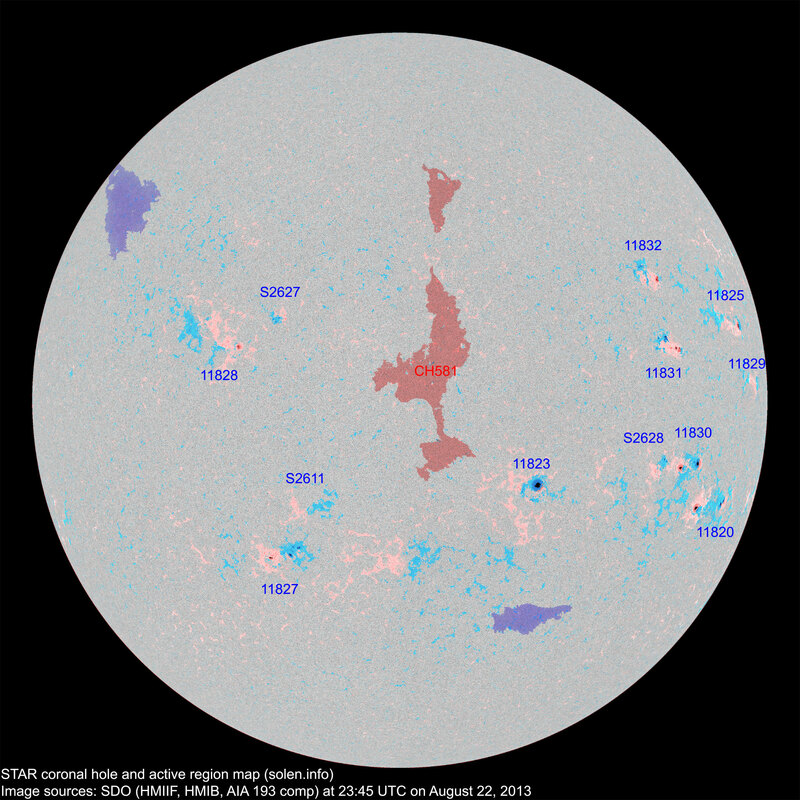 Region 11829 [N04W75] decayed slowly and quietly. 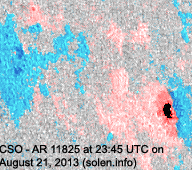 Region 11830 [S05W52] gained penumbral area and was quiet. 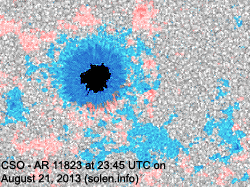 Region 11831 [N13W48] developed slowly and quietly. 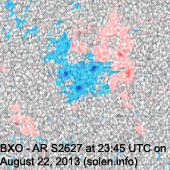 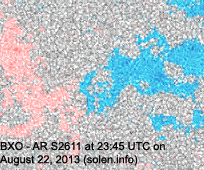 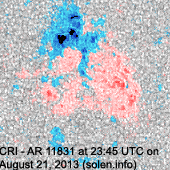 New region 11832 [N25W47] emerged on August 20 and was noticed by SWPC/USAF two days later. 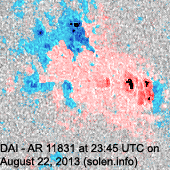 The region has polarity intermixing and could produce C flares. 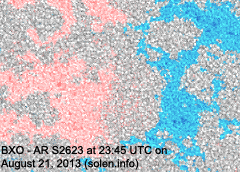 S2611 [S09E15] reemerged with penumbra spots. 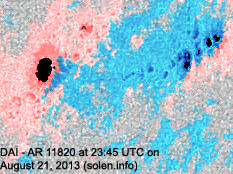 New region S2627 [N19E20] emerged with several spots. 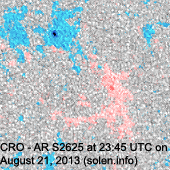 New region S2628 [S05W45] emerged close to AR 11830 with several spots. 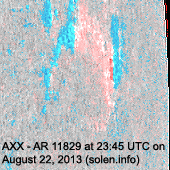 August 21-22: No obviously Earth directed CMEs were observed in LASCO and STEREO imagery. 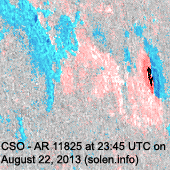 A recurrent trans equatorial coronal hole (CH580) was in an Earth facing position on August 18-19. 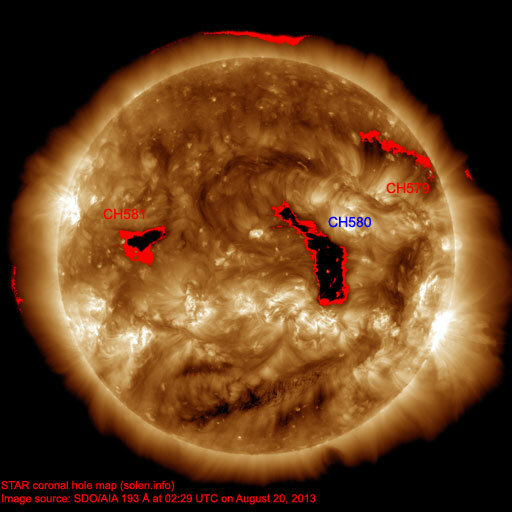 A coronal hole (CH581) in the northern hemisphere was in an Earth facing position on August 22. 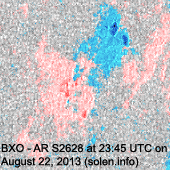 The geomagnetic field is expected to be quiet to active on August 23 due to CME effects from CH580. 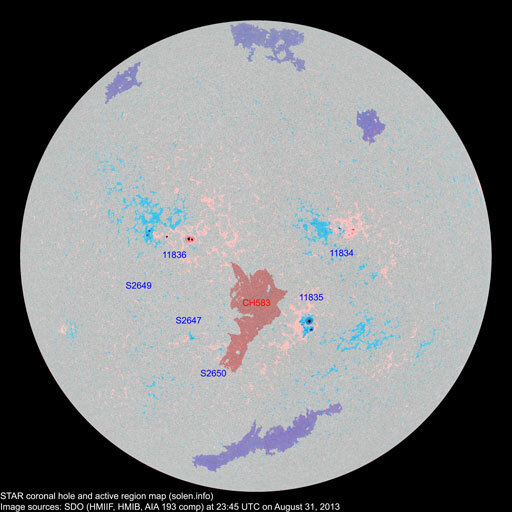 Quiet to unsettled is likely on August 24-26 with a chance of active intervals on August 25-26 due to effects from CH581.